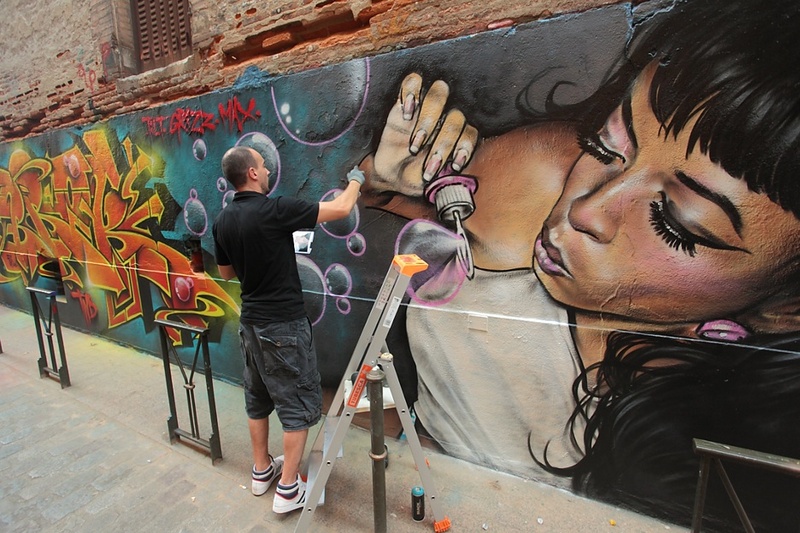 V.V portrait on a wall in Toulouse France!!! This morning was the best morning ever as I got to speak to my good friend Tilt. I absolutely adore him to death and he is definitely one of my favorite people in the world. I feel very fortunate to call him my friend. There are very few people in the world that fill me with incredible joy and he does that effortlessly. He also always sends me the best surprises. This morning, he did just that when he told me his friend Alex created a portrait of me on a wall in Toulouse France. The portrait that inspired this painting is a picture Tilt took of me for his “Bubble Girl” project when he was in NY 2 years ago. My mouth dropped when I saw this picture, I mean….My portrait is on a wall in FRANCE! Alex, the artist behind this beautiful painting, is sooo talented and I am so thankful he took the time to paint me on a wall in a place I aspire to visit. This has made my entire life and I couldn’t be more grateful. I only hope to get to see it in person at some point next year so I can cross it off of my bucket list. Much love from New York. That’s awesome. You’re a star. Sky’s the limit. Not many people can say their face is a work of art in France! XD Dope! Ahhhhhh this is soooo dope…you go girl your internationally known! Love it! Thanks! Tilt and Alex for putting a smile on my daughter’s face this morning. omggg that is absolutely amazing!!!!! you have such amazing friends! i do think its time for vintage vandalism to take a trip to europe!!! to see it for youself will be even more amazing!! Wow, Jasmin, That’s great..That’s how much you are loved.. It looks gorgeous..Great work Alex, and wonderful present Tilt..All of ya keep up the great work.. WOWOWOWOWOWOWOOWOWOWOWOWW!!!!! How freakin’ awesome! You have officially been immortalized in France. Alex is talented! WOW…I guess this means you need to fly to France and take a picture next to it! This is fabulous how a hard effort of a picture taken years ago is reaping rewards today. You have proven that hard work goes a long way and that one should never give up following their dreams. Of course you’re on a wall in France — you’re a star sweets! You deserve it and I’m sure will be getting more of the same! Amazing artwork, holy cow! Love the perspective he used.